Gambling could become one of the most lucrative industries in the British economy, researchers have claimed. By relaxing regulations surrounding betting and gaming and by abolishing tax on punters, the government has ensured an economic boost, they said. That could eventually see more money generated by the gambling sector than any other, said the Betting Research Unit at Nottingham Trent University. It could "only be good news for the economy", said researchers. Professor Leighton Vaughan Williams, director of the unit, said: "Our research suggests that recent policies designed to deregulate the gambling industry are likely to realise significant gains for the wider economy in terms of economic productivity. "From this perspective at the very least, the new phase of casino developments soon to be introduced into the UK can only be good news for the economy." He told the BBC: "I'm not a sociologist, I'm not a psychologist, I'm not a moralist, I don't come from that moral philosophy background. "I'm an economist, and what I'm saying is that this has been massively good for the economy in terms of productivity, and it'll create a lot of jobs as the casinos come through and it'll create a massive amount of inward investment." A spokeswoman for the Salvation Army said it was concerned about the "huge potential social costs linked to an expansion in gambling opportunities, and the likely rise in problem gambling". "There are already around 370,000 problem gamblers in the UK and any rise in problem gambling is far too high a price for possible economic benefits," she said. "A rise in problem gambling is a pretty unattractive prospect for the communities where new casinos are being proposed. 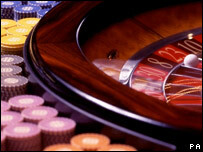 "There are differing views on the impact of a casino on the local economy. Some research has shown that a new casino can have a very damaging effect on the existing local leisure industry." Twenty-seven local authorities are currently bidding for the chance to host Britain's first Las Vegas-style "super casino". Forty-one others have applied for licences to build smaller ones, but only 16 will be successful under government plans. Prof Vaughan Williams, along with Professor David Paton and Professor Donald Siegel, will present the full report at the Royal Economic Society's 2006 Annual Conference at the University of Nottingham next week.